Taco Brothers Saving Christmas slots powered by ELK Studios is inspired by the original Taco Brothers slots game. The only difference is that the slot is having a Christmas theme. It is a five reel and 243 paylines slot game. It is a high variance slot with beautiful graphics, animations and background score. The slot is available to play on mobile as well as the desktop devices. To start playing the Taco Brothers Saving Christmas, you need to place a bet that can range from 0.10 to 50. The various symbols of the slot are tequila bottles, guitars, spades, mining lamps, and cacti. There are three Taco brothers named Paso, Pepe and Pico. If you land up with five of the Paso brother symbol, you can win 400 coins. The wild symbol of the slot is Gold Bell that can replace all the symbols on the reel except the bonus and respin symbol. To activate Taco Brothers free spins, you need to land up with Taco Brothers Wild symbols on the reel 2 and 4 together. You get the free repins for all the reels where there is no Taco Brother symbols spin. In short, you get another chance to land up with three safe symbols which can help you activate the Wild Escape Bonus feature. Once you land up with the safe symbols on reels 1, 3, and 5 simultaneously, you will trigger the Wild Escape Bonus feature. The multiplier that you will get for this feature is decided by a bomb that explodes giving the options as 1x, 2x or 3x. Then you can get 3 brothers, Senorita, and Captain Diaz on the new reels. 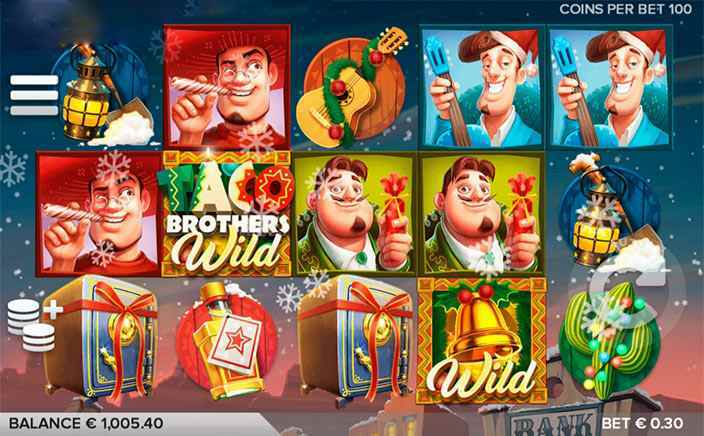 Another feature offered by Taco Brothers Saving Christmas slots is Running Wild feature. In this feature, you can see one of the Tacos brothers fall onto the reels being a wild symbol. They keep on going on the reels till you land up with the Captain Diaz symbol. When Senorita symbol lands upon the reel, it will get the trapped Taco brother’s symbol released. The free spins will continue till either all the brothers get trapped by Captain Diaz or all of them are released by his sister Senorita. 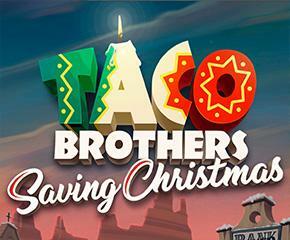 Taco Brothers Saving Christmas slots is basically about the Taco Brothers who are all set for the Christmas festival and keep trying to save Tacos from the evil character played by Captain Diaz. The brilliantly designed story behind the slot makes it an interesting slot to play. Being a highly volatile slot, it has the potential to make you win up to 2,250x your total stake.